Composed by Henri Tomasi (1901-1971). Leduc. Classical. 3 pages. Alphonse Leduc #AL23305. Published by Alphonse Leduc (HL.48182243). 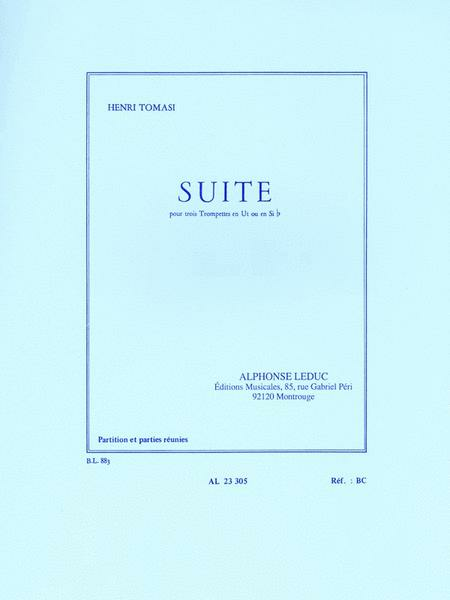 “Suite is a piece for three Bb or C Trumpets composed by Henri Tomasi in 1964. This unusual suite lasts approximately 8'30 minutes. It is divided into three main parts: 1. Havanaise at a Tempo di Habanera, 2. Lento égéen and 3. Danse Bolivienne. The Havanaise is made of a danse part and a more melodious one. Its dialogue in between the Trumpets creates a counterpoint. In the second part, the three instruments alternate the theme with small variations and the last part, '3. Danse Bolivienne', is a toccata. 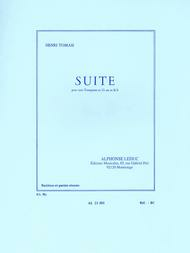 This book features score and parts for Bb and C Trumpets. Henri Tomasi was a French composer, conductor and winner of the Grand Prix de Rome in 1927. He also composed a variety of concerti for Alto Saxophone and for Trombone, as well as some ballades.”.